Mike Prutton prides himself on the high quality hay that he sells, and when your customers include large livery stables, show jumpers and race horse breeders, quality is definitely key. 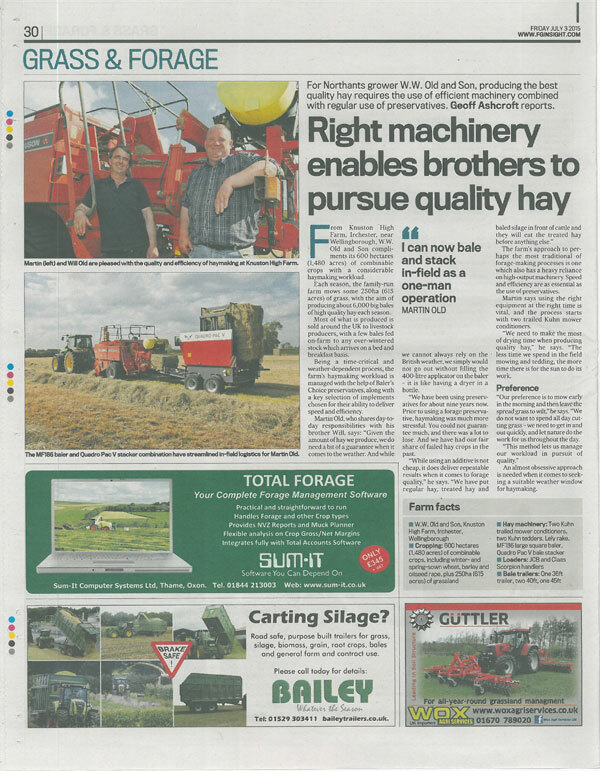 The Prutton’s are long established hay producers and each year Mike makes in the region of 25,000 small and 300 large square bales of hay and straw. Most of the hay is from 3-year hybrid leys but some is also old fashioned meadow hay. 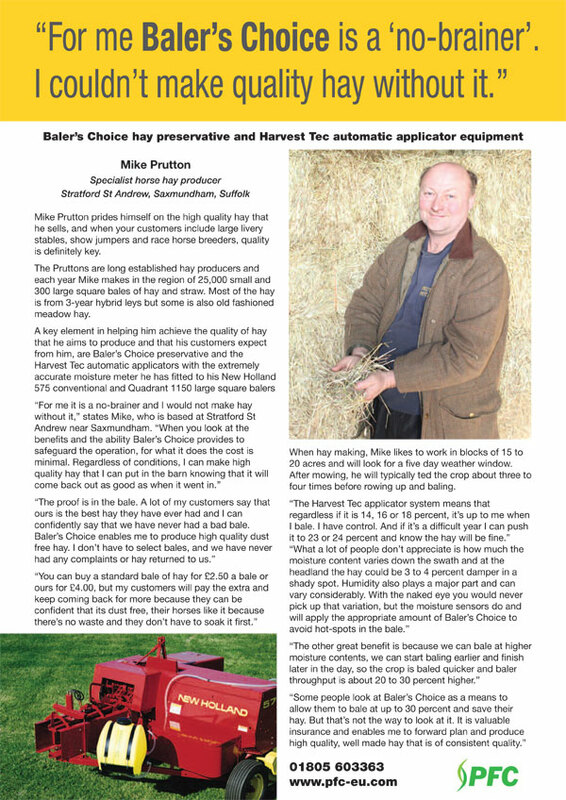 One of the longest established users of Harvest Tec Automatic Applicators and Baler’s Choice preservative is Scrase Farms, who have not only been using the system since 2004, but since 2009 have also been a dealer for PFC through their machinery sales company, Bale Baron UK Ltd.
Scottish racehorse trainer James Ewart is the first to admit that he is a difficult man to satisfy, especially when it comes to the quality of the feed he uses. 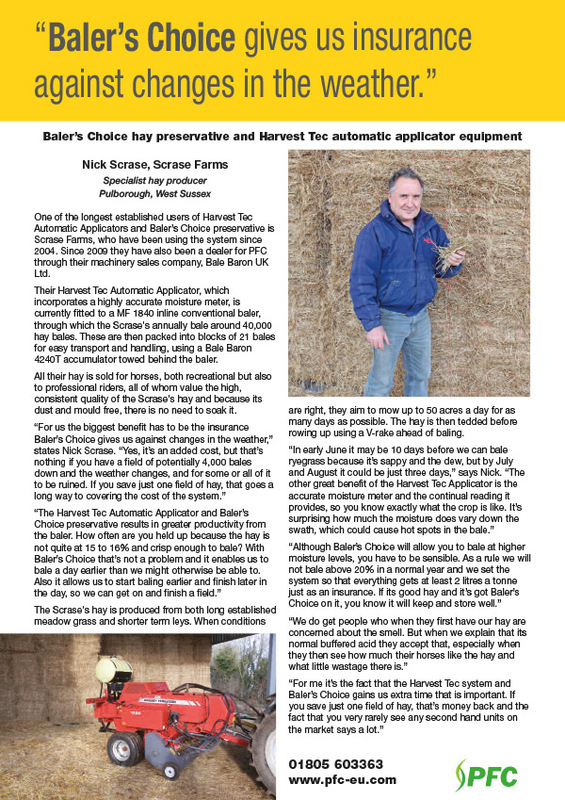 But having used hay treated with BALER’S CHOICE, he states that this is a must and he will now never make hay without it being BALER’S CHOICE treated. 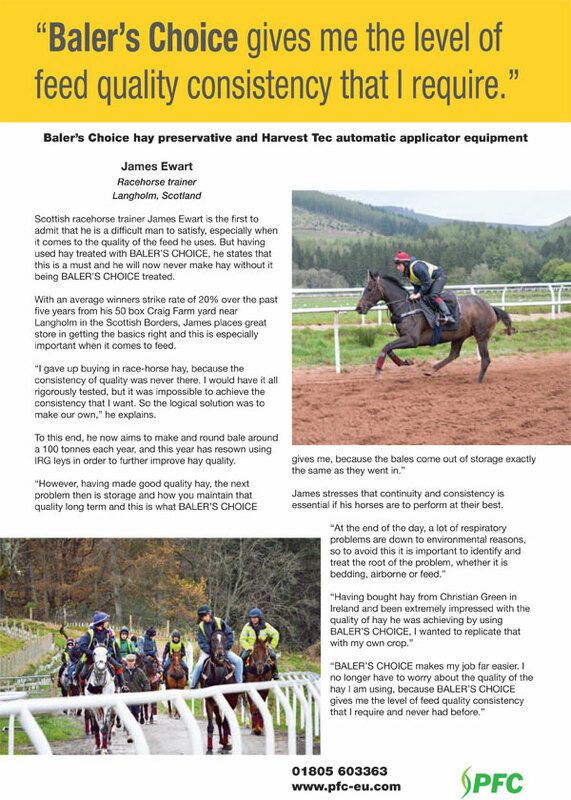 With an average winners strike rate of 20% over the past five years from his 50 box Craig Farm yard near Langholm in the Scottish Borders, James places great store in getting the basics right and this is especially important when it comes to feed. 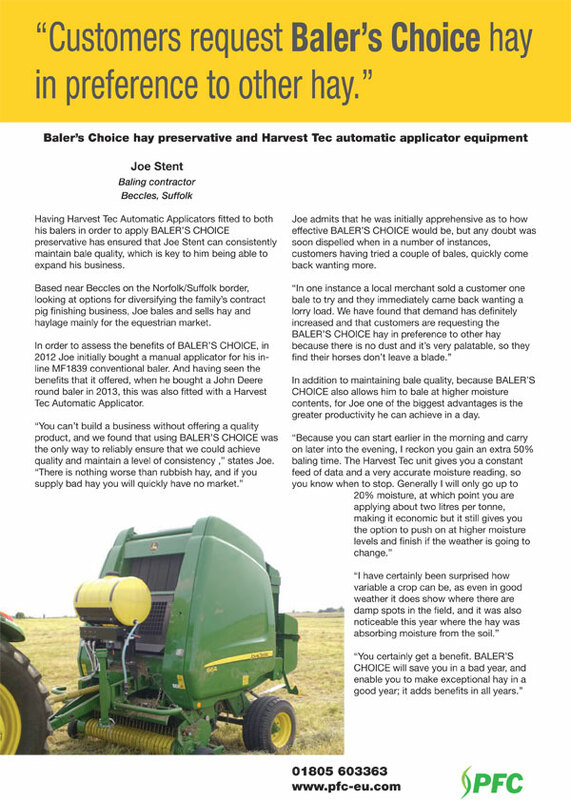 Having Harvest Tec Automatic Applicators fitted to both his balers in order to apply BALER’S CHOICE preservative has ensured that Joe Stent can consistently maintain bale quality, which is key to him being able to expand his business. Based near Beccles on the Norfolk/Suffolk border, looking at options for diversifying the family’s contract pig finishing business, Joe bales and sells hay and haylage mainly for the equestrian market. 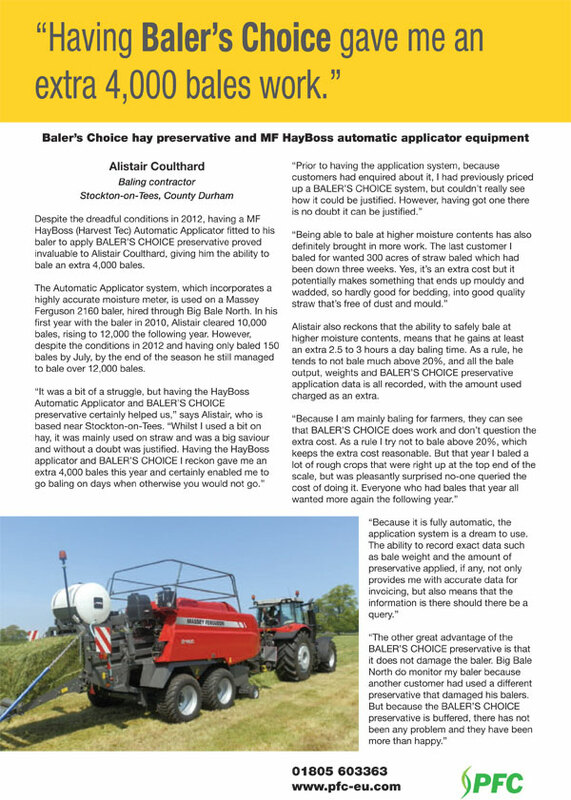 In order to assess the benefits of BALER’S CHOICE, in 2012 Joe initially bought a manual applicator for his inline MF1839 conventional baler. And having seen the benefits that it offered, when he bought a John Deere round baler in 2013, this was also fitted with a Harvest Tec Automatic Applicator. From Knuston High Farm, Irchester, near Welling borough, W.W. Old and Son compliments its 600 hectares (1,480 acre~) of combinable crops with a considerable haymaking workload. Each season, the family-run farm mows some 250ha (615 acres) of grass, with the aim of producing about 6,000 big bales of high quality hay each season. Most of what is produced is sold around the UK to livestock producers, with a few bales fed on-farm to any over-wintered stock which arrives on a bed and breakfast basis.